A review of the Olympus S-HD-100 Hard Disc Drive Storage System and the Olympus PA7 USB Adapter is available elsewhere on this site. The Olympus PA7 plastic case is simply snapped together with four locking tabs (2 on each side). To open, slide a small, thin, flat-head screwdriver in between the seams of the plastic adapter. The photo below shows the internals of the Olympus PA7 adapter. 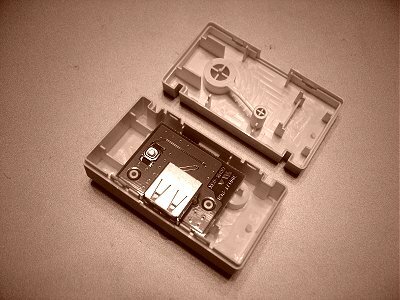 The "COPY" plastic button presses this micro surface mount button, which is connected to the "Dock&Done" connector (see photo below). The middle two pins of the USB connector is connected to the "Dock&Done" connector (see photo below). 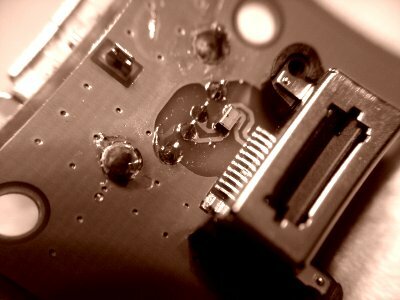 There is a small block of surface mount electronics of unknown purpose. It seems from these photos, that there is no logic occurring at the Olympus PA7 adapter level. All the brain activity happens on the Olympus S-HD-100 Hard Disc Drive Storage System.